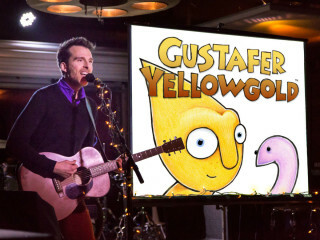 Gustafer Yellowgold’s Show is a multi-media performance of live music, colored-pencil animations ,and storytelling. With its unique crossover appeal, the show has been the wild-card opening act for Wilco and The Polyphonic Spree. Gustafer has appeared off-Broadway in his own productions of Gustafer Yellowgold’s Mellow Sensation and Gustafer Yellowgold’s Infinity Sock. Gustafer the character is a friendly creature who came to Earth from the sun and is living out an explorer’s life in a slightly psychedelic version of the Minnesota woods. $7 in advance, $9 at the door.